I use this product daily on my hair, usually when I'm about halfway done blow drying it and it's slightly damp. You can also use it when your hair is dry. It tames fly-aways and eliminates frizz, without weighing your hair down. It makes it so smooth, silky, and shiny. I have really naturally frizzy hair, especially during the humid summer, and this is one of my favorite products to fix it! 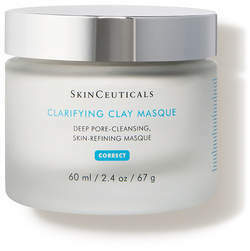 My dermatologist recommended this mask for my skin because I have a few deep blackheads that are lingering, despite the extraction treatments I'm getting from my aesthetician once a month. I've been using this mask once or twice a week and I love how clean it makes my skin feel. It goes on easy, dries fast (15 min or so), and comes off quickly with warm water, leaving your skin feeling clear and soft. I would recommend it to anyone who struggles with acne and large pores, like me! I got this creme a few months ago from my hair salon, forgot I had it, and started using it about a month ago. I love it and I use it along with my UNITE Leave-In Conditioner and/or my It's a 10 Miracle Leave In Plus Keratin. It smooths and helps prevent split ends. This new scent from my favorite fragrance company, Pinrose, smells like summer in a bottle. It reminds of sunshine and beach days, with hints of coconut and sandalwood. It layers well with my other Pinrose favorite, Merry Maker. A Sephora employee recommended this primer to me for oily skin and it was the best recommendation! It feels so cool and nice when it goes on and makes your pores appear smaller and your skin tone more even. I let it dry before putting on my foundation and it feels so light, not like it's weighing your skin down or like glue on your skin. It keeps my skin oil free all day! I couldn't recommend this primer more. I'm obsessed with this body polish! It exfoliates skin while smoothing and nourishing it. It feels like sandpaper but when it washes off, your skin feels so clean and silky. I use it before a spray tan and to get rid of the last remaining spray tan before I get a new one!